It seems like everyone is whitening their teeth nowadays. I figured it was time for me to jump on that bandwagon too. I actually attempted to whiten my teeth about 4 years ago before my sister’s wedding. I went to the dentist and spent over $400 on trays and gels. I ended up not liking it at all. It made my teeth too sensitive and I hated the feeling of wearing the trays in my mouth. So I said good-bye to my dream of having pearly white teeth. I don’t think my teeth are that bad. However, when you look at celebrities and their perfect smiles, I can see a big difference from my teeth to theirs. Even my mom and sisters have whitened their teeth so I stand out like the ugly stepsister in the family. Finally, I decided to attempt to whiten my teeth again. Instead of going back to the dentist, I tried Love That White Smile, a teeth whitening system that is designed to give you white teeth for life. It uses a dual-action foam technology that both cleans and whitens your teeth (and in that order too). It lifts the stains first which allows the whitening agent to penetrate faster. Dr. Jonathan Shainhouse, a cosmetic dentist, created this new product after finding that his patients were disappointed with the whitening products available both over the counter and through dentists. He wanted a system that would minimize the use of harsh chemicals that can cause sensitivity in so many people (me included). I know you are wondering how to use this system and if it’s complicated. My answer is that it is SUPER EASY! I just brush my teeth like I normally and then add a pump of the cleaning foam and a pump of the whitening foam to my toothbrush. Brush the foam on your teeth for about a minute. It has a fresh, minty taste. Don’t swallow or rinse or eat or drink anything for 15 minutes afterwards. That’s it! Seriously! It’s one little extra step to do after you brush your teeth. No mess, no strips to stick on your teeth, no uncomfortable trays! My teeth were fine with it and I didn’t notice any sensitivity. Love that White Smile is pH neutral so it won’t erode your enamel either. The package says you will start to notice cleaner, whiter teeth after 3 days of use. I would say that’s about right. I noticed a difference after about 4 or 5 days and am very happy with the result. I can’t wait to show my mom the difference the next time I see her. The recommendation is to use the Cleaning and Whitening Foam for 30 days and then move onto the 90 day Maintenance Foam. You can keep repeating this cycle for life to keep your smile bright. Can be used on caps, veneers and bridgework. Smoking stains are harder to remove and some can only be removed by your dentist. If you smoke after whitening, your teeth might discolour faster so they recommend using the On-the-Go Cleaning Pen to help maintain your white teeth. Same goes for red wine stains, use the Teeth Cleaning Pen after drinking red wine. Only use the system twice a day (morning and night) even if you brush your teeth more often than that. 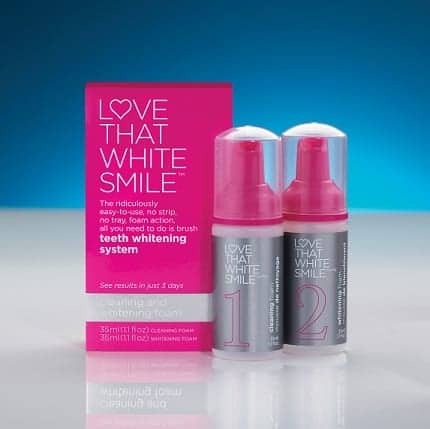 If you have been wanting a whiter, brighter smile, give Love That White Smile a try. It’s available in major drugstores across Canada! Sammi’s Blog of Life | Reviews, Giveaways & Much More!